War novel? Vampire novel? No, it’s just Peter Lovesey again. That’s my new favorite first line from a novel. If you don’t know anything else, you might be pardoned for making some assumptions as to the novel’s genre. Two men are dead on a battlefield. War novel? Two dead men are having a conversation. Vampire novel? Both guesses would be supported from the text, and both would be wrong. 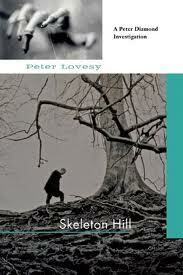 That is the first line of Skeleton Hill, Peter Lovesey’s tenth Detective Superintendent Peter Diamond novel. After the bait-and-switch of the first line, anything is possible, up to and including someone getting murdered twice. Yes, twice, that’s what I said. I’m not even going to get into the whole schizophrenia of setting a crime fiction series in Bath, associated more with Jane Austen and Georgette Heyer than bloody murder. Diamond had a brief, vivid image. It wasn’t long since he’d eaten breakfast. A pause while he regretted phrasing it that way. The Bristol team…[had] found the canteen and liked the all-day breakfast. They might even survive a few days in Bath. He switched [his mobile] off. Right off…Mobiles had their merits after all and one was to achieve non-communication. There are ten other novels in Lovesey’s Peter Diamond series, including the most recent one, Stagestruck. Good to know.